Last fall, I participated in the 40 Days for Life prayer vigil at our local Planned Parenthood. It was the first time I had done this, and I was a bit fearful. (Will I get arrested? Will people yell at us?) On the contrary, the experience was humbling and incredibly moving. After the 40 Days were over, I often drove to Planned Parenthood and prayed on the sidewalk by myself. I didn’t have any “Choose Life” signs, but I did have my bright red Rosary dangling in front of me as I prayed. I don’t know if anyone realized what I was doing, but I was honored to be a silent prayer warrior, speaking for those tiny babies whose voices were silenced before they could ever be heard. I usually pray the Sorrowful Mysteries because they seem appropriate for the situation. As I meditate on each mystery, I realize that abortion ties in with Jesus’ sorrows. While praying the first Sorrowful Mystery, I recalled a statue I saw several years ago at a unique highway shrine off Interstate 40 near Groom, Texas. The statue depicts Jesus kneeling on the ground. 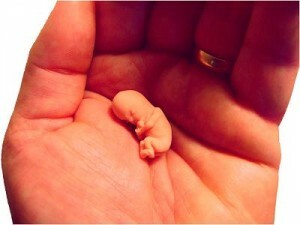 In His hand, he holds a tiny fetus. A gravestone nearby honors the millions of babies who have been aborted. This heartbreaking piece of art makes me think of Jesus in the Garden of Gethsemane, weeping over the loss of those precious lives. As I pray the second decade and meditate on Jesus’ scourging, I consider the suffering those tiny babies endure during an abortion. They are scourged by their own mothers in what should be the safest place on earth, the womb. I can’t even begin to imagine the horror as I fervently beg for an end to this holocaust. During the third mystery, the Crowning of Thorns, I envision how the soldiers mocked Jesus as they pretended to do Him homage. Abortion mocks the sanctity of life, it mocks the sacrament of marriage and it mocks the Blessed Trinity of which a family is an image. Abortion is a heavy cross to bear. As I contemplate the Carrying of the Cross, I recall that women who have had abortions often report depression and grief among other negative effects. Sadly, the person often forgotten is the father of the child, who may be an unwilling participant. These men also experience grief and mourning. Our prayers can be powerful pleas to change hearts and minds. During Lent, commit to praying at least one hour at a 40 Days for Life vigil (40daysforlife.com) If you can’t participate, then please pray your next Rosary or dedicate a fast for an end to abortion.